Seth Gunderson :: Mr. Chan is my buddy. As we progress more and more into this magical age of technology, it's great to know that our email service providers are ever-increasing their knowledge of what is spam and what isn't. I recently switched my all of my email to run through Gmail – on the recommendation from my previous email provider. He said that they have much better spam services/filters than he could give me. The switch was pretty easy and now my email syncs between all of my devices with no hiccups (now if we could only get Outlook, iCal and Google Calendar to speak to each other). 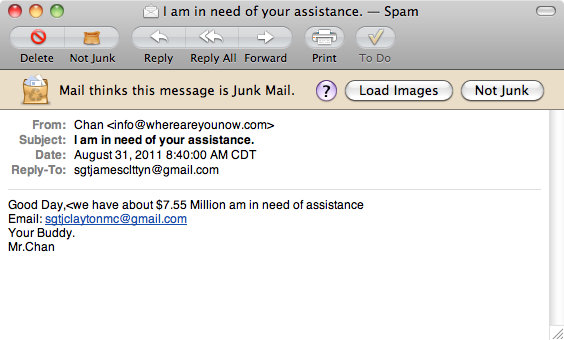 Because of these enhanced spam filters, I check my Spam folder every other day to make sure I'm not missing anything. Its a good thing that I checked today, because as much as Gmail doesn't want to believe it – Mr. Chan IS, in fact, my buddy. I haven't heard from him in several months. I was getting worried. He recently joined the Army under a fake name – yup, you guessed it, MC J Clayton. And it sounds like he faired quite well. Now he's a damn sergeant and has a ton of money to spend. And get this, he needs MY assistance. NOTE: for all of you moochers and/or freeloaders (not to mention email-reading snoopers) out there, don't even THINK about emailing him at sgtjclaytonmc@gmail.com, because he won't answer you. That money is Mr. Chan and mine to split and buy tons of Star Wars books and Doctor Who audiobooks with. Or maybe I'll buy 18 iPod Touches (yes ... even though I have an iPhone, iPod Nano and iPad ... so I like Apple, sue me*). I could even buy a 100 Jimmy John's gift cards. Really, the possibilities are endless – just as long as they don't add up to $7.56 Million. I know what you're thinking, you need a friend like Mr. Chan. And you're right, you do. He's incredibly self-less and wants nothing but the best for me and my future. Good ol' Mr. Chan. Maybe some day you'll get to meet him. *I would STRONGLY recommend you don't sue me. Mr. Chan and I will have roughly $7 Million for whatever attorney fees we accumulate after our shopping spree at American Apparel.